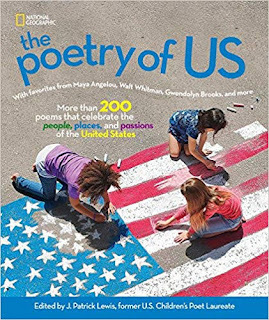 The Poetry of US (ages 8-12, $24.99) contains more than 200 poems, all showcasing the diverse people and places of of the United States. Curated by former U.S. Children’s Poet Laureate J Patrick Lewis, familiar verses and brand new voices accompany striking photographs as the reader embarks on a literary trip through all 50 states and the many cultures, traditions, histories and passions that define us. Poems are arranged by region, from coast to coast, and among them are works by Langston Hughes, Dorothy Parker, Robert Frost, Naomi Shihab Nye, Walt Whitman, and more. Reflecting the United States’ melting pot of people, the distinctive voices of immigrant and minority writers as well as poems in Spanish, Arabic, and Korean with accompanying translations into English are also featured. From the familiar to the surprising, subjects include people, places, landmarks, monuments, nature, and celebrations. Inspiring, thought-provoking and particularly timely, this collection of poetry and photography eloquently reveals the spirit that unites US. Celebrate the gift of language and the vibrant culture of the United States with this collection of classic and never-before-published poetry. Poems are arranged by region, from coast to coast,and are designed for family sharing, but geared to younger readers, this beautifully illustrated treasury is a must-have for the family bookshelf. With three children ages 10 to 17, plus several nieces ranging from age 2 through 7; there is a lot of opportunity for reading and family enjoyment of books in my house. Poetry is one of those subjects that I personally love but have trouble getting many of the kiddos to read or listen to. The Poetry of US is a wonderful book that has easy to read and understand poetry that caters to kids (and adults) of all ages. Even the 17 year old boy got involved reading to the younger girls. I loved the cultural poems in the variety of languages that were translated into English. A book I recommend for any household!